Race 1 and 2 are done and suitably dusted, with potential series champs lined up and ready to race for final victory. 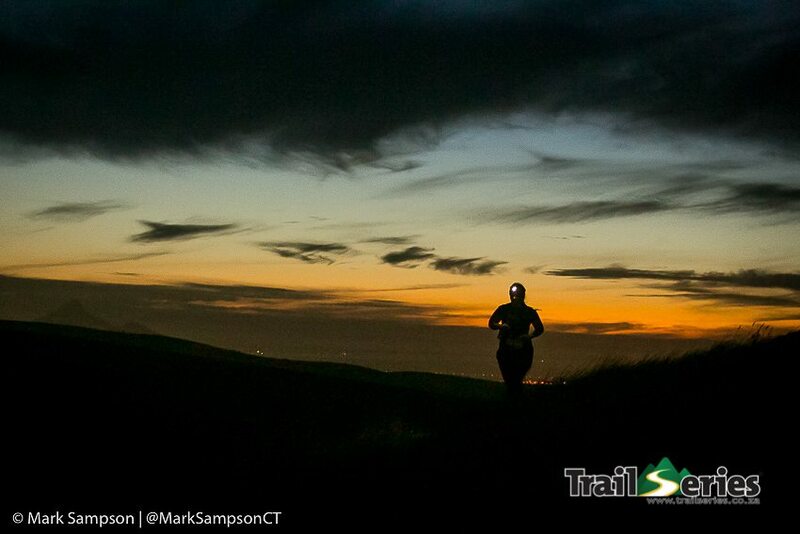 A sunset run at Meerendal, and a classic Oak Valley throw down are still to come, and the vibe couldn’t be hotter. 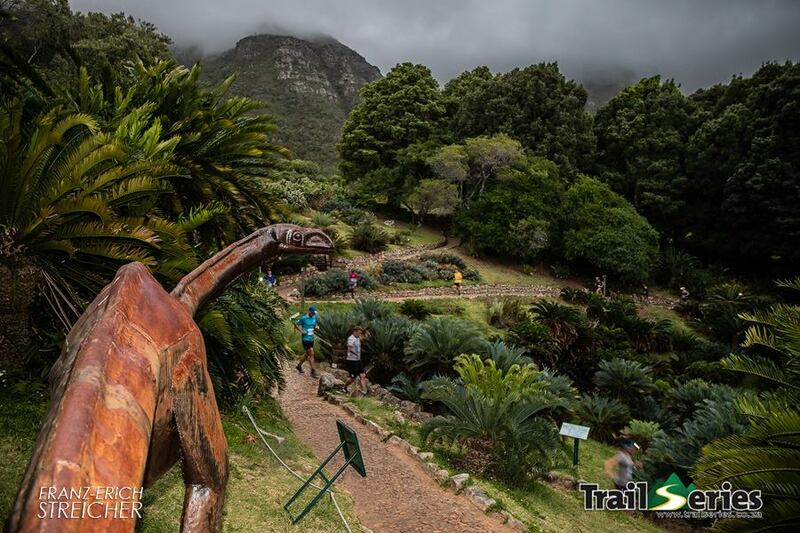 The first race in this year’s edition of this popular series was made up of a 10km (400m ascent) and 5.8km (309m ascent) at Kirstenbosch Gardens. Participants enjoyed the amazing experience of running past the fragrance gardens and up onto the fringes of Cecilia Forest along the contour path. After the beautiful mountain trails, there was a playful technical descent followed by a magnificent indigenous forest, all as the sun went down. In the long course, the A batch was destined to give it a proper smack. Names such as Siviwe Nkombi, Stephen Millard, Rory Scheffer, Lucas Adams, Jono Black, Peter Tsawayo and Daniel Claasen took off at whiplash speed. The finish line crew were ready with seconds to spare as Nkombi stormed through, taking 40 seconds off the previous course record to finish in 38m48sec. 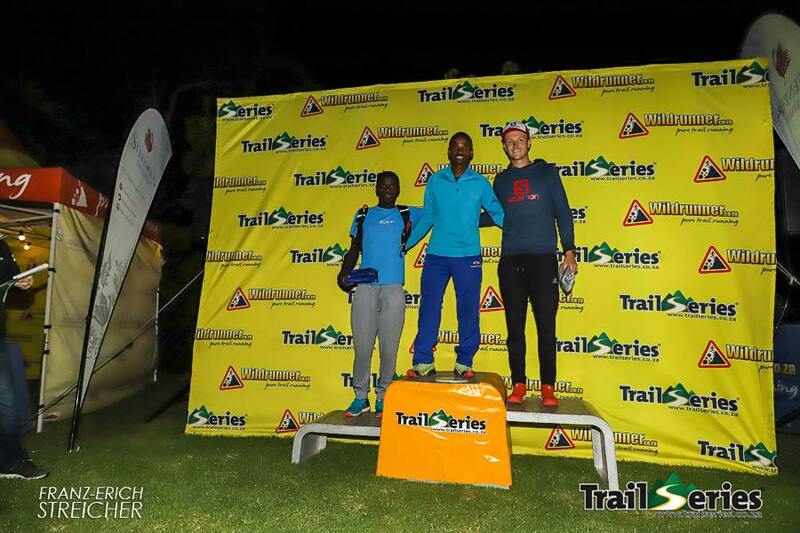 Scheffer, too, finished within the previous course record, in 39min24sec, and Tsawayo rounded out the podium in a time of 39:32. Mags Wright was first woman home in 52min20sec, followed by a visibly surprised Carla Whitehead, just 20 seconds later. Third on the podium, and first master female was Julie Huckle in 52min53sec. In the short course, Jaco Loots put it all out there to finish in an impressive 27min31sec. Rob Tweddle followed hard in 27min53sec, and the humble Jethro Dunn continued his dominance of the Junior category, coming in third overall in 28min15sec. First woman home was Vicky Stevens in 35min49sec, with Nadine van Taak just under a minute behind her. 20 seconds later, Minimee runner Erin Kennedy took third spot. By race 2 in this 4-race series, things always start to get interesting. Individuals committed to achieving particular outcomes rock up with a keen eye for their competitors. Tactical decisions are made according to working the point system, and the finish line becomes an exciting place to watch it all unfold. The usual mix of every level of trail runner came through to play on the beautiful Lebanon Forest mountain bike trails. 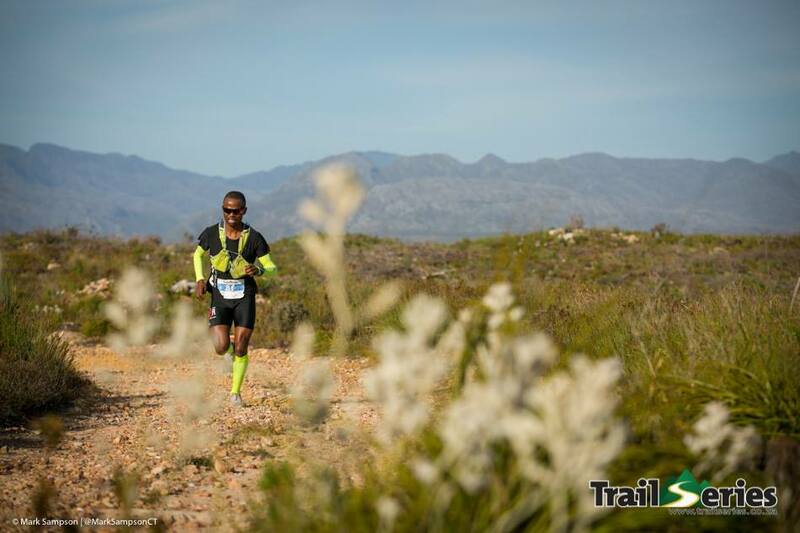 The route offers a classic mix of exciting single track, forest paths and fynbos studded trail through orchards and playful switch backs. The 13.4km long course was once again stacked with speedy potential. Siviwe Nkombi took an early lead. Hot on his heels were Peter Tsawayo and Emmanuel Dlamini. Word from the course was that these three, as well as Lucas Adams, left absolutely everything out there as no one gave an inch. It was only in the last 3km that Nkombi shook his rivals, taking the win in a time of 52min42sec. Tsawayo followed in 55min32sec, with Dlamini taking third in 57min17sec. Adams came in some 2 minutes later in fourth position, with high praise for the three men ahead of him. In the women’s race, globe trotter Meg Mackenzie came through in sixth position overall, and first woman in 59min55sec. 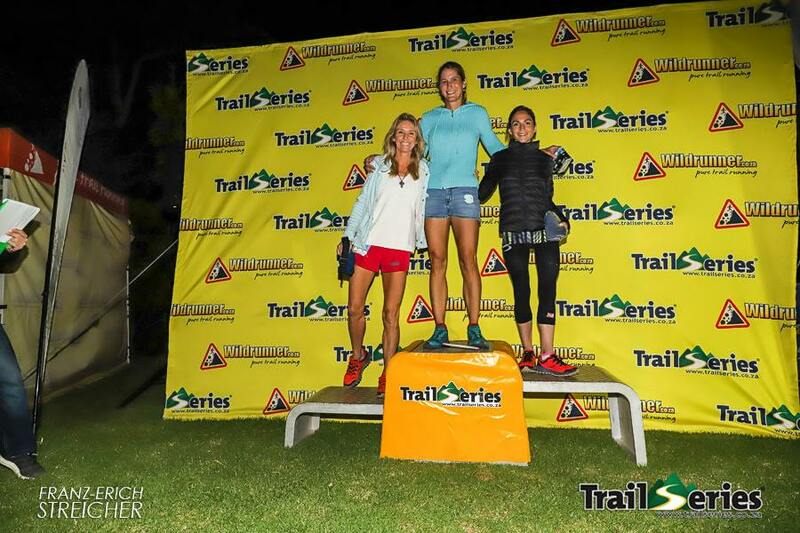 Friend, fellow Salomon runner and friendly rival Daneil Feldman was second woman in 1h56min53sec, and talk of the day was master (50+) runner Suzette McIvor, who scooped third in 1h09min36sec. The finish line was a hive of activity with the winners tape switched swiftly to the short course chute in the midst of the racing action. Rob Tweddle took the 6.3km course in just 25min47sec, with first woman and second overall, Bianca Tarboton 2 seconds behind him. The couple raced the small hill to the finish in an entertaining, all-out effort which could have gone either way. Jaco Loots was second man across the line in 26min31sec, with 14 year old Deon Bochnig rounding out the podium in 27min07sec. Second woman in the short course was Tyra Buncombe in 31min13sec, and third spot was taken by Carey Pike in 32min29sec. Meerendal, the host for Race 3 on Wednesday 30 January, runs predominantly on perfectly manicured mountain bike single. A playful, undulating course that offers a solid dose of pure fun and gives the roadies a chance to go hard against their trail competition. Online entries for race 3 will remain open until Tuesday 29 January, and for race 4 until 31 January. Race 4 will be at Oak Valley on Sunday 3 February. 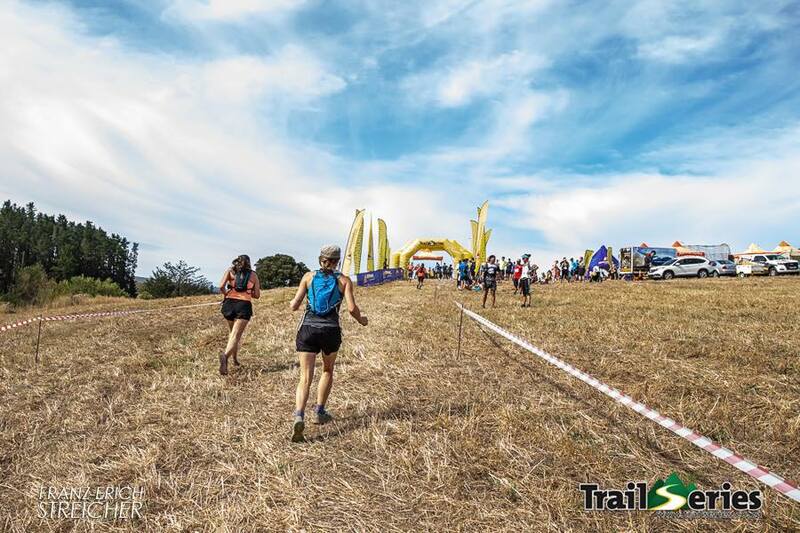 With exciting prizes from Jaybird, BoldGear, North Ridge, Hydro Flask, Steenberg and Petzl, as well as the classy 4004 finisher’s tee for those who successfully entered on time (21st Jan) and go on to complete completed 4 of the (same distance) series races, there is something for everyone to run for. We cannot wait to see how this series will end!